Let our local HR professionals handle all immigration procedures for your foreign employees based in China. With today’s global technology and communication capabilities, companies are deploying more foreign workers in China’s jurisdiction. Visa application can be a complex task, as immigration laws and policies are constantly changing. With the recent influx of foreign workers in China, the Chinese government has implemented security measures, such as filtering systems to categorize foreigners. This system has made it difficult to be eligible for work in China, as requirements are stricter and more challenging to meet. The employee’s country of origin and applicant category often complicate the process. Fast & efficient visa management. Dedicated account manager for your application. HROne oversees all visa and work permit applications on behalf of hired employees. We work closely with you and your employees to understand the visa and permit process, which involves obtaining a temporary Work Z visa and converting it into a resident and work permit upon entering China. Our professionals advise you and your employees on the necessary documentation to provide for the application. We also efficiently and accurately use the provided information to complete all application materials. HROne facilitates the submission of the application to the appropriate government authority and oversees its approval. HROne also assists in the renewal of you and your employees’ visas upon expiration. We check that you meet the applicable criteria and assist with the renewal in accordance with local laws and policies. We handle all your visa, work permit, and residence permit applications and procedures from initiation to approval to minimize any chance of error or insufficient information.Let HROne handle your visa and immigration concerns while your focus on building your business abroad. The client company provides HROne with necessary information regarding visa needs. HROne collects relevant documentation from the client and employee and verifies if they meet all requirements. HROne submits all application materials to the appropriate government authorities. HROne receives the approved visa and delivers it to the client in a timely manner. HROne helps you apply to obtain a Work Z Visa. This visa allows an employee to enter China for work purposes. The Work Z Visa is a single-entry visa that is valid for 30 days, allowing an employee to enter China and settle into housing accommodations or residence. Once the employee arrives in China, we assist in the application for a work permit and residence permit. The work permit allows the employee to legally work in China under the management of a foreign company. The residence permit allows the employee to legally reside in China and travel abroad for the duration of employment. The residence permit can be renewed at the end of its validity to extend the period of residency. HROne prepares the Work Z application and handles the conversion to work and residence permits for each employee. We make the visa and permit application process as seamless and quick as possible. 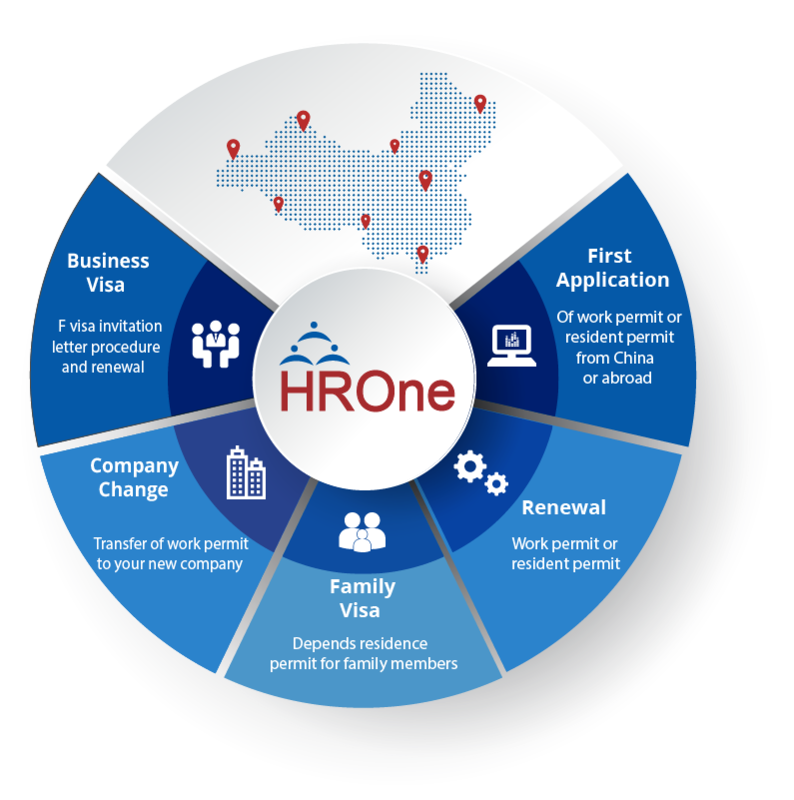 HROne oversees your Business M Visa application. The M Visa is intended for individuals invited to China for the purpose of business, commercial, and trade activities. It is often used by those visiting China for conferences, events, meetings, trade shows, and factory visits. However, it does not allow the individual to conduct any direct profit-generating activities. There are different types of M Visas available depending on the needs of the client and duration of the employee’s stay. Business Visas are generally valid for 30, 60, or 90 days. There are also Business Visas with single, double, or multiple entry provisions. HROne helps clients and employees apply for the most appropriate M Visa to minimize the possibility of error or prolonged approval.